My Kids Stole My Brain: Why I love being a mom TODAY! I don't know about you, but watching my children sleep is one of the best things in life and I swear it's not only because they are finally still and not bugging the tar out of me. There is just something so innocent about their little, sleeping faces. My favorite part is when a little grin appears out of nowhere, there's just no sweeter sight. I especially love watching them doze off in the car, in my rearview mirror. They try so hard to keep those little eyes from closing and then their head starts bobbing and moments later they are out like a light. This is one of the many reasons why I love being a mom. What's your favorite part of being a mom today? p.s. 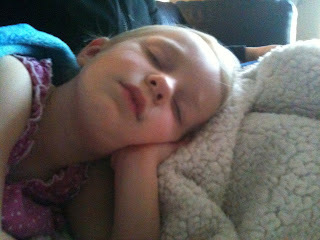 speaking of sleeping...if you're a mom with a good sense of humor & not easily offended, you have to go to youtube and search "Go the F%$* to sleep" read by Samuel L. Jackson - guaranteed to make you laugh!